KayKiSpeaks.com: WAIT! 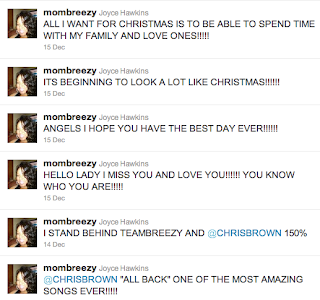 Is Mama Breezy Orchestrating a Chris Brown & Rihanna Reunion?! WAIT! Is Mama Breezy Orchestrating a Chris Brown & Rihanna Reunion?! 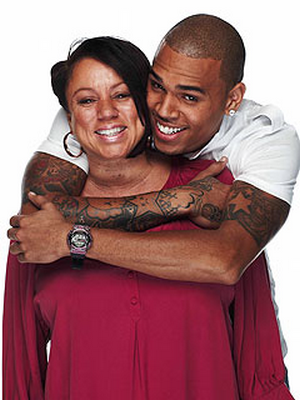 Chris is definitely a mama's boy. His mom stood by his side through the toughest time in his career (and I'd be willing to say life) and looks like she is making it known that she's in support of his next personal steps too. OK..so Ive been watching twitter lately and it seems that Chris Brown and Rihanna have been subtweeting each other regularly! I mean, it just so happens that their tweets are about love lost and of course we want to believe that they are talking about each other . They may just be randomly commenting on other stuff right?! WELL yesterday I noticed something very..very interesting. Read the 4th tweet down.. I may just be making up the Chris Brown and Rihanna subtweeting, but this is obviously subtweeting between these two. 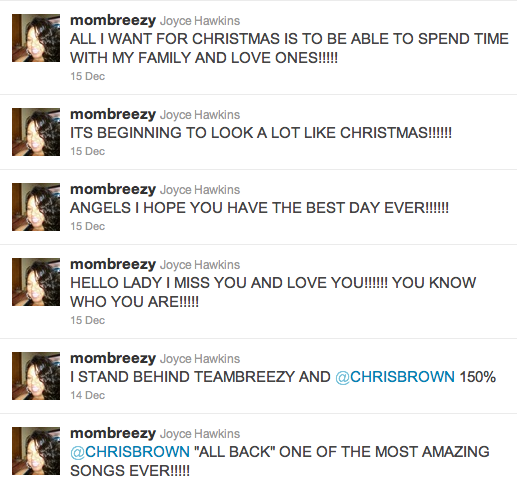 Consider the tweets that came just before Mama Breezy's tweet to Rih. She says she supports her son 100% and "All Back" is the most amazing song ever. Well when I heard All Back I immediately thought of Rihanna and Lord knows if these two ever got back together, they'd need a strong support system because the media & people are going to try to eat them alive. I love Rihanna & Chris together. I grieved with them during their domestic violence incident and break up, because it was all so unfortunate. I hope that both of them can reach a mature place in mind and spirit and give it another try. Whether this is really subtweeting or not -I wish them the best!